Christmas training: Eat, drink and run! Christmas is like no other time of the year. However, for the athlete it is always filled with temptations – an extra 30 minutes or so on the sofa to watch television, lie-ins instead of training and enough food to feed a small army and that’s not to mention the alcoholic beverages! For the dedicated athlete, it can be difficult to stick to your plan and achieve your goals and even more so when all those around you seem hell bent on helping you stray! So here are four simple things to bear in mind to help you through the holidays and keep you running healthily. If you know that balancing your training with the demands of family is going to be difficult, then plan to make some compromises now. This might mean being flexible about what session you do, where you do it and for how long. You can negotiate with family about when you need to do your key or breakthrough sessions, and they can make it clear when your presence is required at Aunt Myrtle’s mince pie party! Look at where alternative sessions might be required – can you get away with a 6am jog before you travel to the in-laws? How about a cross-training session in the gym instead of the group intervals you had planned? Once you have agreed and negotiated your plan, stick to it. Get up and dress in your work-out gear – it sends clear messages to all that you’re going out for a run, no matter what may happen. Similarly, you can’t expect your family to be flexible just because you fancy a lie-in, so keep your end of the bargain to avoid arguments. Kids, weather, bountiful food and illness can all wreak havoc – just let it go in one ear and out of the other. New research shows that a single (hard) interval session can offset the effects of a single blow-out meal. If that sounds like your Christmas Day, put it behind you and start again the next day. Don’t treat it as an excuse to get into a rut and have another bad day. If grazing is your weakness, consider removing the Christmas chocolates from the lounge and getting them out only when you intend to eat them – it’s all too easy to grab one (or two) when you walk past. You could also look at substituting sugary foods for more wholesome ones – dried fruit and nuts are great for snacking. 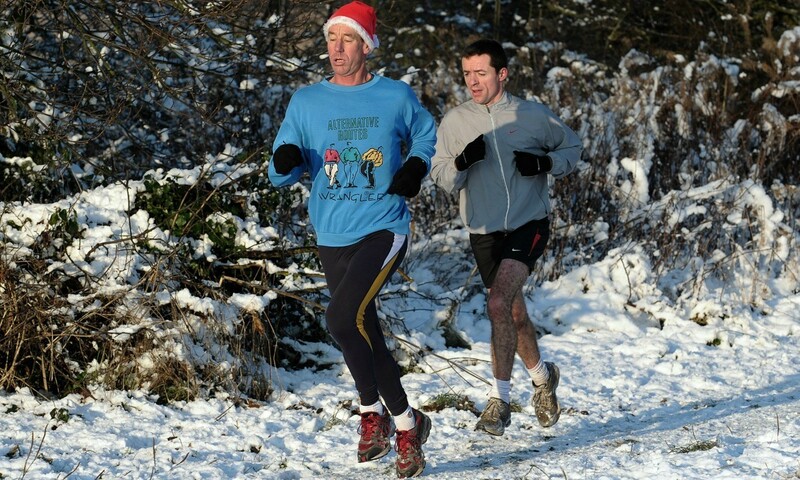 Enjoy your Christmas break, and if you look after yourself, your running will benefit greatly! Have a merry running Christmas!